A groundhog comes running at a dog and a family, and they think it’s there to play? Groundhogs make a high pitched sound whenever they are agitated, so it would make sense that this rabid one would also use that vocalization. My useless show-type golden once got into an altercation with a groundhog. It wasnot a rabid one, just a stupid slow one that allowed a stupid, slow dog to catch it. It was quite hilarious to watch a groundhog beat up a golden retriever. And then the field-line dog sailed in and killed it in five seconds. 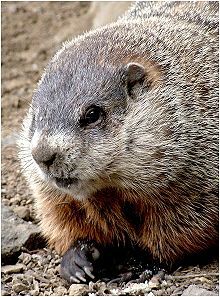 In my part of the world, groundhogs are about the only animal that digs extensive burrows. A few years ago, the groundhog population dropped. This was, of course, blamed on the coyotes. If any animal population drops, the coyote is to blame. There may have been some truth to it, because most of these groundhogs grew up in a world without much predation, except for dogs, which are notoriously bad at predation. A dog will have a hard time catching a groundhog if all it does is run it into into a burrow and then spends the next 45 minutes barking at the hole. Coyotes use a different technique. A few smarter dogs also use it. The coyote or dog just waits outside the entrance to the burrow and flattens its body against the ground. It allows the groundhog to come out. It lets it forage until it reaches a point where it cannot run back to the hole before the dog or coyote can overtake it. When it reaches that point, the dog or coyote pounces. That technique may have been a bit of problem for our coyote-naive groundhogs. However, that wasn’t the main worry. The main worry was that dens would no longer be dug. Foxes and den-nesting raccoons would have no place to hide or raise their young. Cottontail rabbits would have no place to seek refuge during the coldest days of the winter. All of these animals rely upon the dens that groundhogs dig. Foxes can dig their own den, but the soil is so rocky in West Virginia that they’d rather just renovate a groundhog burrow. Of course, natural selection has favored more coyote-wise groundhogs, and their numbers are stable. The burrows are being dug. But I hope none of them get rabies. Groundhog holes are retriever leg-breakers. 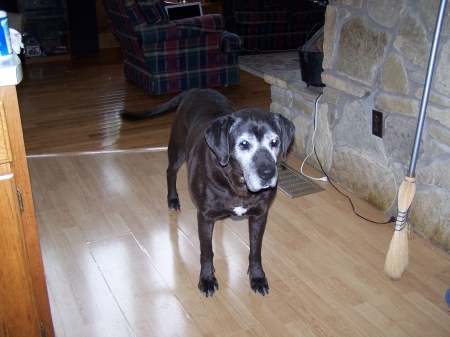 This dog broke her left hind leg in a groundhog hole.